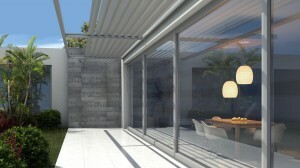 All of the benefits and features of the Parma system are available in the Pergola application. The Parma Pergola provides a full range of roof positions. Louvers can be stacked to either direction, and tilted both ways, or completely closed, satisfying any need in a matchless way.